Not even a year into his tenure at British Vogue and Edward Enninful has managed to tap everyone from Taylor Swift to Oprah, and last month made Rihanna the first black woman to appear on the title’s September cover. Enninful shows no signs of slowing down the exclusives, scoring most of the Beckham family (David Beckham is sadly absent from the newsstand cover) for the October 2018 issue. 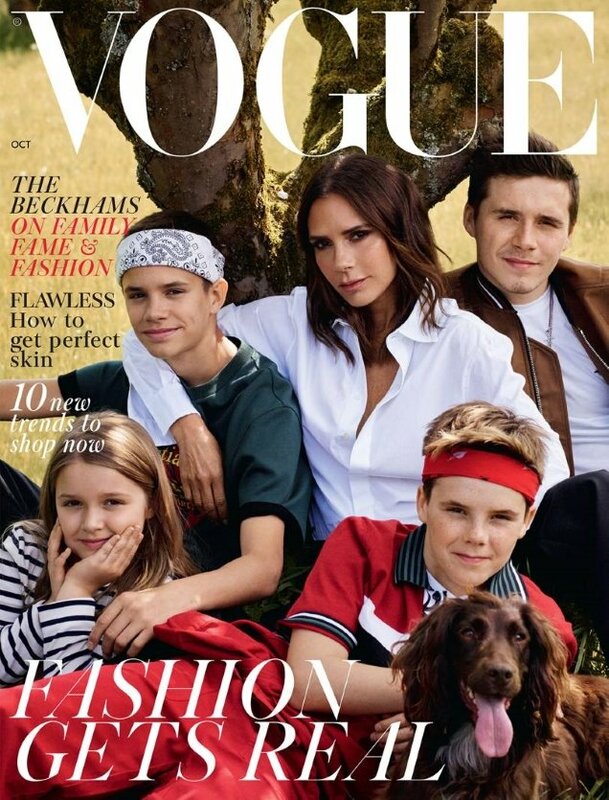 Victoria Beckham is no stranger to the magazine (this month’s cover marks her fifth appearance) and is now joined by her four children, Brooklyn, Romeo, Cruz and Harper Seven (plus Olive the dog), for a family portrait-style cover. Photographed by Mikael Jansson and styled by Kate Phelan, the world-famous family was shot on location in Donnington, England. Our forum members weren’t exactly…sentimental over the cover. “This looks like a poor man’s Tommy Hilfiger ad. Where’s the fashion element? Did Edward decide to give them a free family portrait? If that’s the case, well, by all means, give one. But don’t let us the masses see it,” commented Ken Doll Jenner. “Looks like the default picture in a photo frame that you throw away after buying it,” mocked bluebanter. “LMAO! No one will convince me this isn’t a People magazine outtake. Absolute garbage, and I actually like Victoria. Edward did her dirty with this mess,” mepps wrote. “It’s dreary! Edward, where’s the glamour?” asked PierreGotha. LastNight was let down by the cover, too. “It’s a perfectly fine image, but it’s not a Vogue cover. I love Victoria, so I’m happy to see her here, but her previous covers have been significantly better than this offering,” he said. “I don’t have much of an issue with there being the whole crew present but this just isn’t a particularly strong image. It’s not even in the slightest bit fashion-led, Brooklyn appears to be squinting at the sun and Harper’s pose is a little bizarre,” noted honeycombchild. Check out the subscribers cover where David Beckham joins in and share your thoughts on the shoot here.